Fight the high price of textbooks, and put cash in your pocket! Selling your books at your bookstores buyback is a great way to battle the rising cost of textbooks. When you sell your books back, you allow other students the opportunity to purchase their books from a stock of used inventory, saving those students money. Do something good for yourself and your fellow students; sell your books back today! 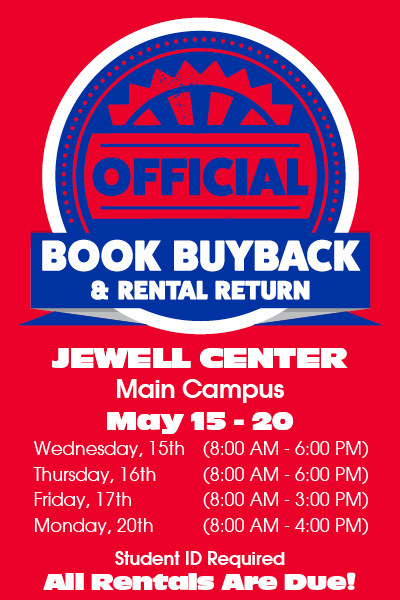 Make sure to return your rented books back to the bookstore by 5/20/2019 before 6:00 PM. You may return all rented books back to either the buyback window, or to one of our store registers. You must have your STUDENT ID.